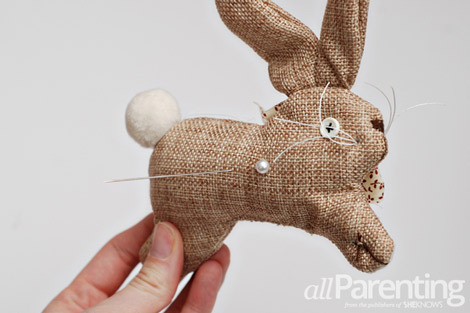 Easter decorations don't have to just be cute, they can be pretty too! 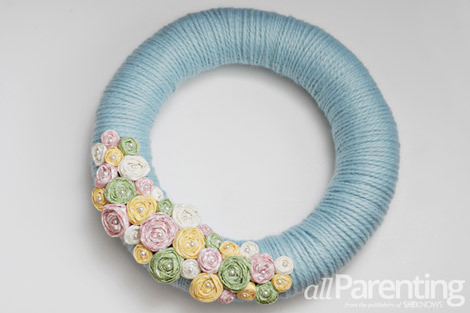 In just a couple of hours you can transform some ordinary yarn and fabric scraps into a beautiful Easter wreath to decorate your home! 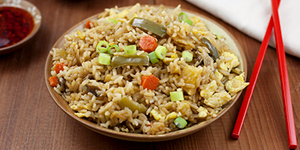 A big part of Easter is the gathering of family and friends. This year when your guests arrive, wow them with this pretty Easter wreath that they'll never believe you made yourself! Start wrapping the yarn around the wreath form. Keep wrapping the yarn until you have covered the entire wreath form. I wrapped mine twice for extra bulk. 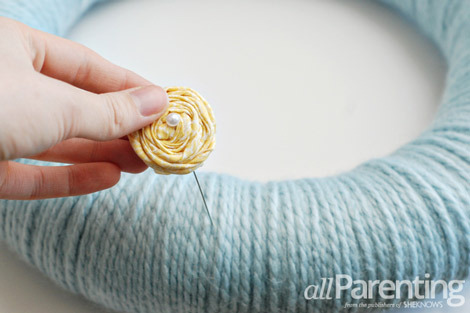 Tuck the end of the yarn in to the wreath. 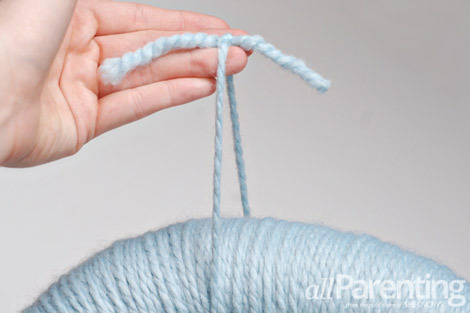 Be sure to save yourself an extra 8 to 10-inch piece of yarn for hanging the wreath later. 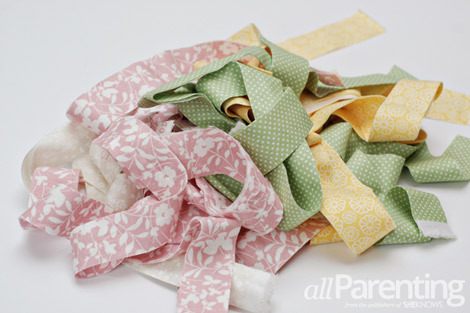 Start cutting your fabric lengthwise into 1-inch wide strips. 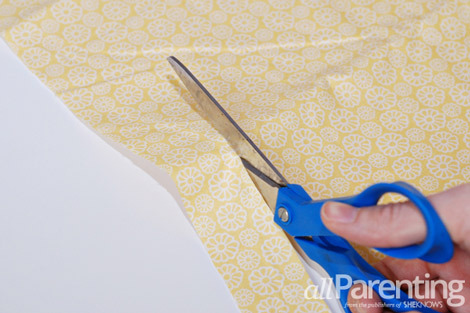 Keep cutting out fabric strips until you have cut out all of the fabric. 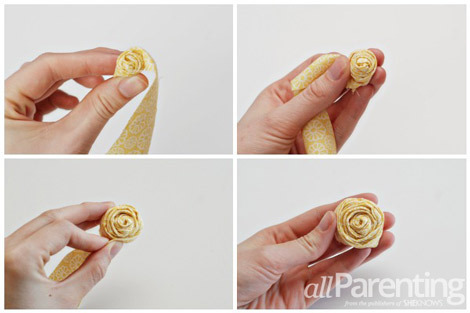 Start making the fabric flower by tying a knot in one end of a fabric strip. 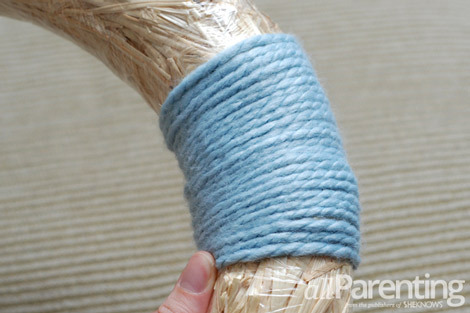 Twist and wrap the fabric around the knot. Use the hot glue gun to glue the fabric in place every three wraps or so. 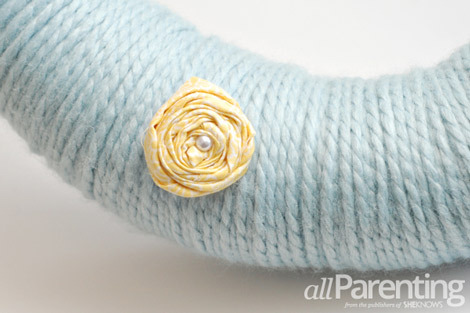 When the fabric flower has reached the size that you want, cut off any excess fabric. Cut out a circle of felt that is slightly smaller than the fabric flower. 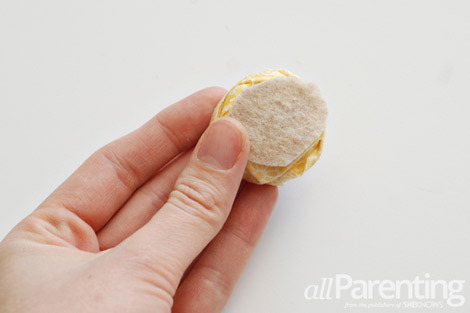 Glue the felt to the back of the fabric flower. 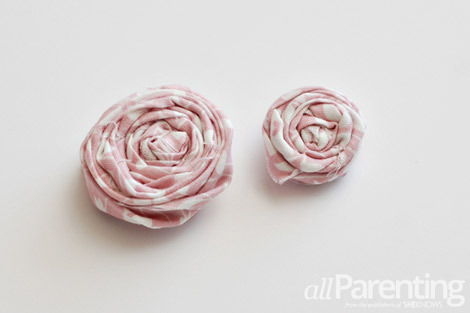 Vary the size of the fabric flowers by using different lengths of fabric to make each one. 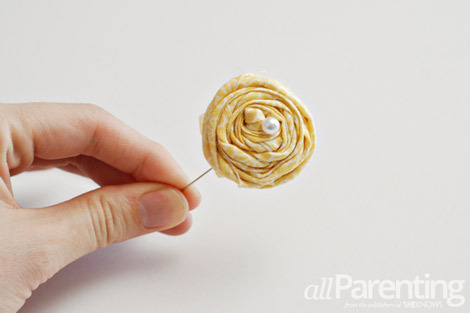 Feed a floral pin through the center of one of the fabric flowers. 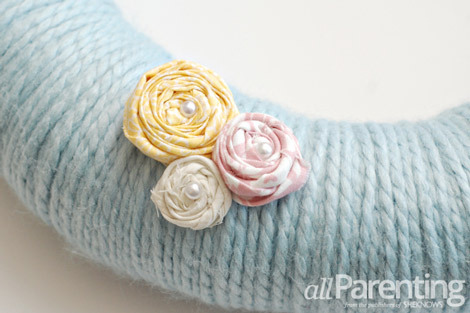 Poke the pin through the yarn and into the wreath form. 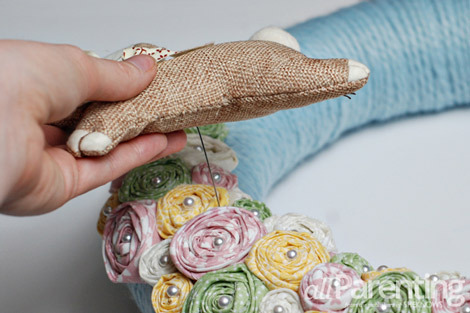 Press the pin all the way in until the fabric flower is flush with the wreath. Pin more flowers on the wreath. Don't leave any spaces between the flowers. Keep pinning until all of the flowers are on the wreath. I used 33 flowers total. 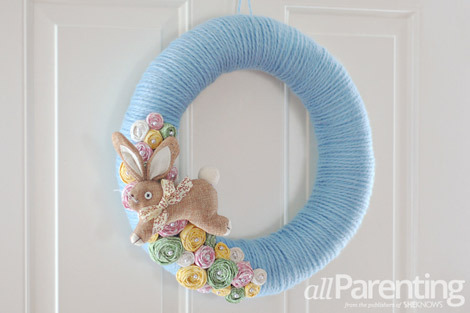 Pin or hot glue the plush Easter decoration to the wreath. I chose a bunny that I found at the craft store, but you could use an Easter egg, a bird or anything else cute that reminds you of Easter. 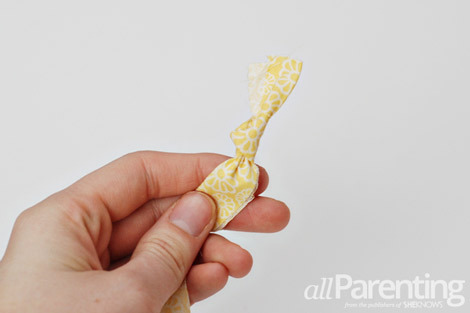 If you choose to pin it, thread the floral pin through the fabric and then bend it into a right angle. Slide the pin in between the flowers and pin the decoration to the wreath. 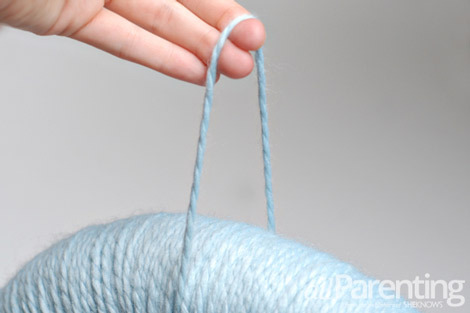 Grab the extra piece of yarn you saved from wrapping the wreath. 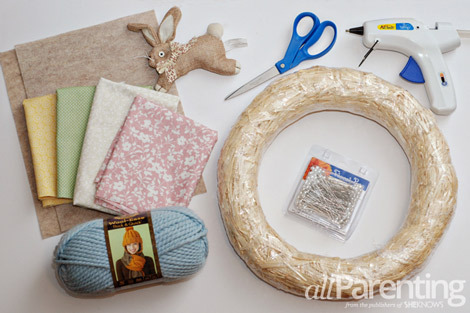 Loop it through the wreath and tie it in a knot to create a hanger for the wreath. 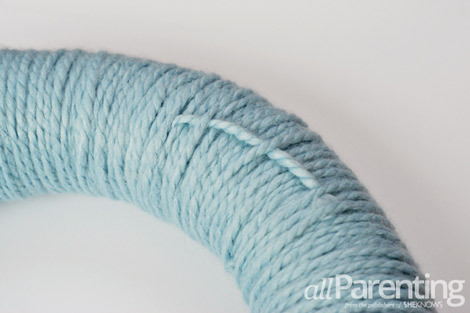 Slide the yarn so that the knot is hidden behind the wreath, then hang your pretty Easter wreath!